Sometimes you may need to add text to a cell, one solution is to use a new column and use formulas. To gain a clear grasp on this topic, you have to know about these three functions: LEFT, RIGHT, and LEN. The following formula adds: “ID:” and a space to the beginning of a cell: =”ID: “&A5. Then copy this formula in other related cells. Read how to copy the formula. 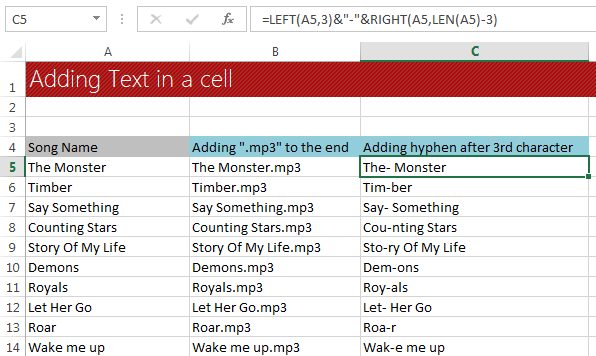 The following formula adds “.mp3” to the end of a cell: =A2&".mp3"
Using formula adding text in Excel. It’s simple. Download this file to work with adding text in Excel cell. Use both Sheet1 and Sheet2 worksheets. 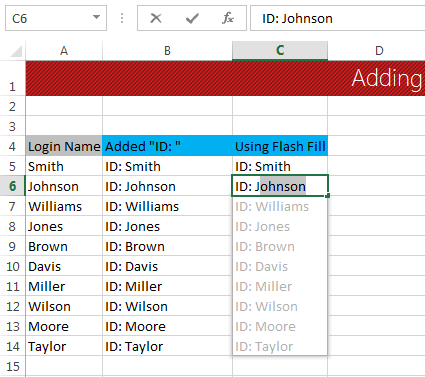 You can also do the above job just using the new feature Flash Fill in Excel 2013. You have to at first know how to use Flash Fill. If you have read the above link, it is simple to adding text in a cell using Flash Fill. In our example, we have added text in cells using Flash Fill. For example, in cell C5 in Sheet1 type “ID: Smith”, press Enter. In cell C6 start typing “ID: J”, Excel will show suggestion for you like the following figure. 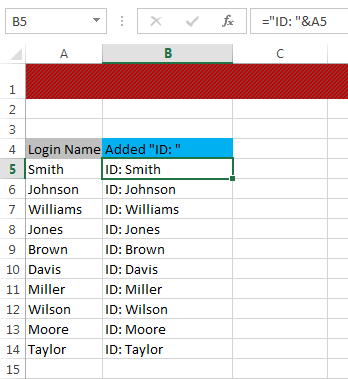 Adding Text in a Cell using Flash Fill. Press Enter, you will get your desired data.